When White Wizard Games attended 2018 PAX Unplugged in Philadelphia, we hosted several high profile contests. Exclusive Legend Tournaments offer participants the chance to enhance the game, its self! Several past Legends have seen their likenesses featured in recent sets. 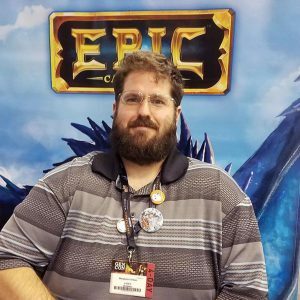 At this show the Star Realms and Epic Legend Tournaments were each won by Ben Green. This is the first time a player has earned two Legend championships at a single show! We asked Ben to reflect a bit on the experience. M: Ben, tell us a little about yourself. You seem to be pretty competitive! B: I’m from Allentown, PA. I’m a forklift operator for a pharmaceutical packaging company. I’ve been playing card games competitively for over 20 years. Besides Star Realms and Epic I’ve also enjoyed some success playing Magic, Hearthstone, and Elder Scrolls: Legends. M: You have enjoyed high-level convention success with several games. What are some things you do in preparation for a high profile competition? B: Mostly I just try to play as much of whatever game I’m preparing for as I can. This way I’m familiar with the cards and interactions that may come up throughout the tournament. M: This Epic event featured the Dark Draft format. What are some factors that are most important to you when making card selections? B: Early on in a dark draft I try to be as flexible as possible. I don’t like to commit to a color by picking up loyalty cards too soon. From there I try and figure out what my decks overall game plan will be, and pickup cards that synergize with that game plan. M: Naturally you have to play to what you’re offered. That being said, would you admit to hoping for great cards in a particular faction? Is there a non-obvious card that you personally cannot pass on? B: My favorite faction has always been sage. Epic doesn’t punish you for splashing around in all 4 colors though, so I’ll pick cards like thought plucker, muse, erase and hasty retreat no matter what the rest of my deck looks like. A pet card I usually look to pick up is army of the apocalypse. At worse it’s a draw 2, and if you manage to combine it with some blitz creatures it can turn into a really potent win condition. M: What about Epic appeals to you over other competitive card games? B: I like the resource system in epic, being limited to one gold per turn makes for a unique experience compared to other card games. I also like that I only have to buy all the packs once. One of the reasons I stopped playing magic seriously is I got sick of having to trade or buy new cards every time the format changed. M: How did you enjoy PAX Unplugged experience in general? Do you plan to attend again in the future? B: PAX was an awesome experience overall. There was so much to do that I wish there was more time to enjoy it all. Most of my experience playing both Epic and Star Realms is online, so it was nice to get to play the paper version. Both of the tournaments I played in were run well, and from what I noticed WWG did a great job of promoting their games. M: Any hopes or speculation as to how White Wizard may portray you in game? B: As far as star realms goes I was hoping to be a base. Mostly because it hasn’t been done yet. I was thinking maybe a Magnetic Fortress, as a play on my online name. For Epic I haven’t put much thought into it. All I know is I hope the card is strong and see’s a lot of play. We thank Ben Green for taking some time, and congratulate him on a big double win. Find Epic at your local game store or in the White Wizard Games store. Get the Epic App for Free! Be one of the first ten commenters on this article to win a Steam key. Keys will be delivered within one week to the email address associated with each comment. Great interview Ben and sounds like another stellar convention for WWG! Epic app please and/or thank you! It’ll be interesting to see a person represented as a base. Epic is an amazing game. I played it since the baseset. Although, my local countries does not have much player. I do enjoy purchasing from the online store and then forward them to my country. Card arts are good and mechanics are great. Can see the creator puts effort to make balance cards. Dark draft will always be most love in this game. High skill and high reward. It also varies each time. I am looking forward for future expansion and hope they continue to publish the physical cards too! Love star realms epic and really exvitesnfor sorceror. Love white wizard games looking forward to sorceror. Love the games. Just recently started learning Epic and love it so far. Thanks for your insights!